Books and other things: Finding Your House in a Famous Hopper Painting! 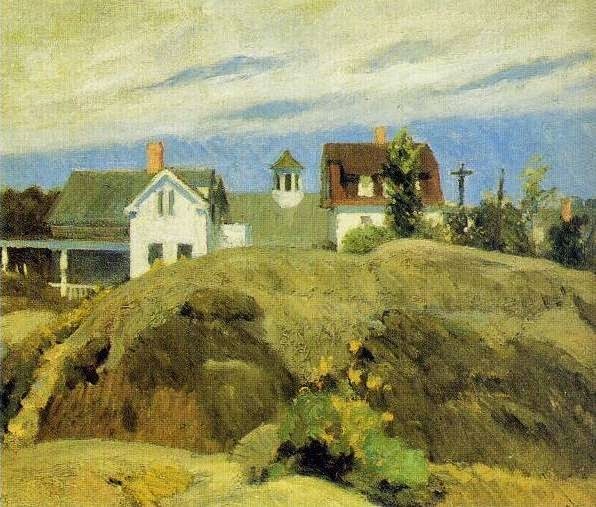 Recently a friend sent me an article on a painting by Edward Hopper called Rocks and Houses, Ogunquit. The writer of this article, David Millward, was astonished to discover that the house in the picture was his own, somewhat changed in the 100 years since Hopper painted the picture but the scene still recognisable. The rock in the front had been partially blasted away to make easier access to Perkins Cove, the barn in the middle was gone and also the verandah - while the next door house had been flattened . . . yet, despite these changes, his house was there in the middle behind the remains of the rock. 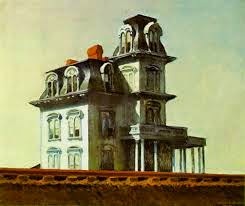 It had lost much of its quaintness and I wonder if Hopper would have felt it to be as interesting and worth painting if he was to see it now. Hopper was intrigued by interesting architecture and houses. But for Millward, it must have been so interesting to see how the scene appeared to the artist all that time ago. What a delightful discovery to make! 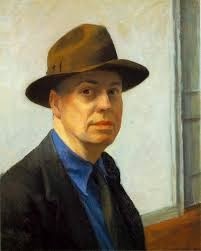 The picture had been bequeathed by Hopper’s wife, Jo Nivison, an artist in her own right, to the Whitney Museum in New York along with many others. 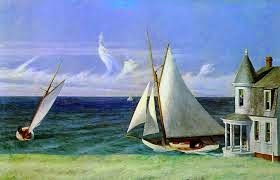 Hopper was a prolific painter. Many of his scenes have become very well known. His House by the Railroad was the model for Hitchcock’s film Psycho, the tall, spooky house where poor Janet Leigh met her death in the infamous shower scene. It has to be said, it is a strange looking house! Millward managed to persuade the museum to allow him to come and see Rocks and Houses , now in storage, in situ. They finally agreed and he was able to view the original painting. Unfortunately, Millward would have been unlikely to afford to purchase it. Hopper’s painting now sell for millions. But when this early painting was done, he wasn’t the famous artist of later years and it isn’t necessarily his best work. My daughter introduced me to the paintings of Edward Hopper and I absolutely love his work. They are not only full of light, space and interesting scenes, they also tell stories. Hopper himself was a taciturn fellow but his pictures spoke volumes. The idea came to me one morning at breakfast with a good friend in Alexandria, Washington to write a story about some of the pictures. I have written six so far and hope to add more as time goes on. Interestingly I began with House on the Railroad and it became a bit of a spooky story involving a mother! I didn't realise at the time that Psycho was based on such an idea and I still haven’t watched the film . . . it gave me the creeps just seeing the trailer. But it’s interesting that this is what the picture drew out of people. Something interesting in Hopper’s psyche, no doubt! Houses, the sea are associated psychologically with the idea of Mother and the Feminine. And houses, sea, boats and women appear in so many of the Hopper pictures. I love the one above . . . The Lee Shore. It is so full of movement and light. And like so many Hopper paintings, taken from strange angles that make the house appear to be in the sea itself. Hopper spent time in Paris in his youth and learnt a lot from Degas who tended to use interesting and different perspectives. My Hopper stories can be read on my website www.lorettaproctor.co.uk . I would have loved to make a book of them but it would have entailed writing to varied sources to gain permission to print the pictures with the story. 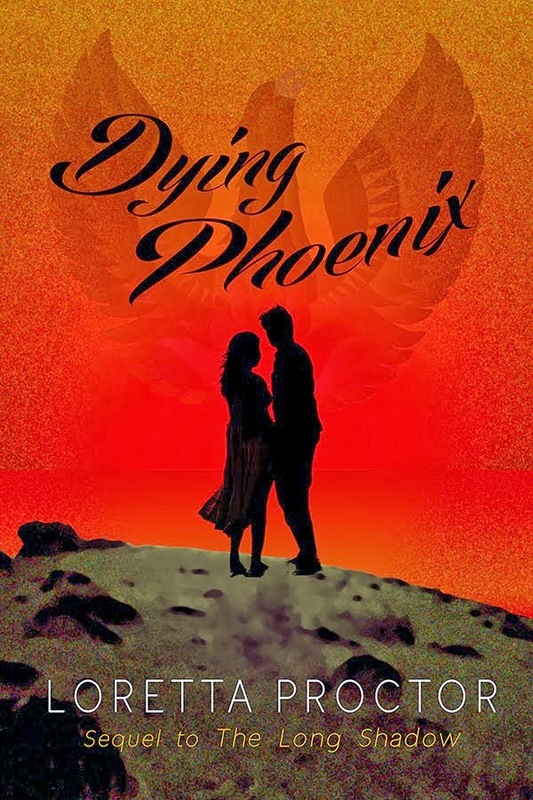 Without the pictures, the meaning of the story would not be as dramatic. I hope some of you will take a look at see if you feel the stories fit the pictures. All I can say is, these are the stories that came to my mind. You may have others, far better.